Though we have already discussed about the slowness in computer and respective remedy to fasten up, but let we see another process to eliminate it instead rebooting the computer what we does often. When a computer is running with the application it will occupy the available memory and each and every the applications is taking place it just continues without releasing it properly and finally the accumulation of the process due to memory leakage results the system slow. In this case, in order to recover the speed, a clean up is needed over unused memory and this what VC RamCleaner utility does. 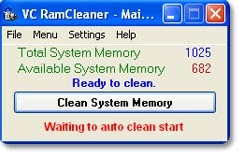 After launching VC RamCleaner utility: click on Clean System Memory button to clean up process which will take few minutes and while the process is going on you can see the figure shown at Available System Memory keep on increasing and once the cleaning process is completed, it will display the total MB of memory that has been released. It will display Total System Memory and Available System Memory in MB. Standard Passes will not force to release all unused memory. Passes Until Zero as the name implies it will force each round of cleaning process to release unused memory until zero byte of wasted memory being achieved. Settings > Set Clean System Memory, tick the Deactivate checkbox and set the number at either Standard Passes or Passes Until Zero option.